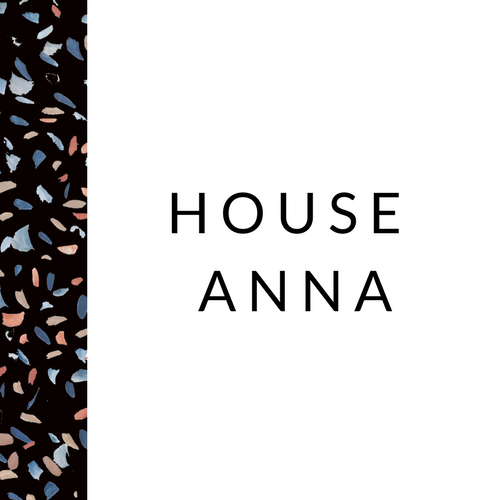 So the time has come to say goodbye to Camilla Pearl, the name of the blog since starting it in July 2016, and say hello to the new name "House Anna", eeeek. I thought it might be nice to share the reasons why I've made this decision and give you some of the backstory to name change. There's still much to do with the design of the logo but I'm thrilled to at least, have the new name finally out there. Camilla Pearl was the name of my old business. Many moons ago, I had an online store selling luxury baby boxes filled with newborn bits and bobs which I sold all over the globe. E-commerce was still kind of a newish thing back in 2009 which was an appealing challenge and I started the biz when Camilla was 6 months old as a way of keeping my creative side busy and launching a brand. I designed the gift boxes themselves with my wonderful graphic designers, which were covered in a small scale floral pattern, see below. As time went on more and more customers started to mention how lovely the design was and that they were using them as display storage boxes in their homes. I kept plugging away at the biz, which by now, had a small but loyal customer base. On the side I started playing around more and more with prints and patterns off the back of the lovely compliments I had received from my customers about the box design. Because I had never been trained in Surface Pattern Design (I took a Politics Degree at University), it was purely an arty thing to do on the side. I enrolled in a local screen printing course with Sunny Todd (of Sunny Todd prints) and really got stuck into experimenting with pattern over the next couple of years. After coming to the realisation that I wanted to focus entirely on this area, I decided to wind down the baby boutique and focus on getting my designs made up into wallpaper, my long standing obsession. Just out of commercial interest I showed my wallpaper samples to the design director of Sanderson who I had met a few months earlier at a Art launch. I will never forget the day I took a big book of my designs to Chelsea Harbour and sat nervously with her and her assistant in the Sanderson/Zoffany showroom whilst they flicked through my work. To my surprise they both loved the patterns. They told me to go and experiment with scaling up the designs and adding more colours into the mix and to get back in touch when I had a polished collection. So this is what I did for the next year, increasingly becoming more involved in the interiors world, alongside a part time job in a legal firm. I then fell pregnant with baby number two and little Harriet arrived in 2015. A year of maternity leave and then another 6 months back at the legal job meant the wallpaper project got well put on the back-burner, until I started the interiors blog. So thats where the name originally came from for the blog when I started it 18 months ago. Because from a practical perspective, I had the domain name, the email and all the branding from the original business, and it was a pretty name that was special to me, it seemed like the obvious thing to roll with it! In hindsight, really it would have been better to start with a new name from the get-go. After about a year of settling into blogging, it quickly became apparent to me that the name just wasn't the right fit. For the obvious reason Camilla Pearl is not my name, and so people were confused when they learned my name was Anna. Often I couldn't realistically go into the whole explanation of the name Camilla Pearl, and it was becoming more and more confusing for people. Emails were addressed to Camilla and when I met people in person they called me Camilla. All in all, a bit of a mind boggle. So alongside all of this, the design element came back into my life as the blog grew and last year I made the decision to pick up where I left off and attempt to launch a collection of homewares (the wallpapers are on the horizon too), which is where I'm at now! I wanted to start the year with a new name which (a) is easy to remember (b) could work as a long-term blog and brand and expand into lots of different areas of style and design, all under one roof, or "House". Plus it has a bit of me in it and hopefully people will definately get my name is Anna! I would love to hear what you think of the name...do you like it?? Change is always a bit of a scary thing but I'm embracing it and I'm excited for House Anna!